Dr. Christopher Chang was quoted in a Nov 4, 2012 article published in Voice Council Magazine. The Voice Council Magazine is based out of United Kingdom and focuses on "practical insight for the emerging vocalist." 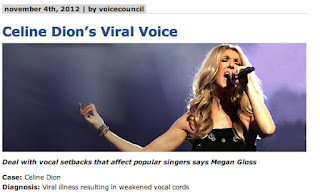 The article by Megan Gloss was focused on why Celine Dion cancelled her concert 2/22/12 in Las Vegas (a viral laryngitis), a subject I already blogged about here. Read the published Voice Council article here. Celine Dion's Viral Voice. Voice Council Magazine 2/22/12. Viral Infections and Singing — More From Dr. Chang. Voice Council Magazine 2/22/12. Why Does EpiPen Have to be Injected into the Thigh?